We carry a variety of colors to enhance the beauty of your entrances, walkways and any other area you wish! Like all other aspects of our landscaping you can share your ideas and goals so we can make your landscaping perfect. Many of your flowers may end up in small beds because of your time or space requirements. In this case, remember that flowers attract the eye. Use the spots of color strategically for accents, and always place them where you want people to look. Do not plant other colorful flowers to hide the air-conditioning unit or another eyesore; flowers simply draw attention to it. Annuals, spots of color call for an annual that looks good for the longest possible time, such as Madagascar periwinkle, impatient. Annuals also work well when used to fill in between perennials and shrubs in a bed. Because, they bloom for months, their color is a constant you can count on as other plants fade. Annuals are also a nice tool for unifying a mixed planting. Try repeating one or two types throughout a bed to bring unity. Perennials, large beds and the mix of flowers within them define a classic English treatment called a border. For an effective border, be sure to provide a strong background to help the plants stand out. Plan a color theme such as pastels, bright colors or all white. Choose plants with as much seasonal variety as possible, and the border will show off year-round color. Annuals can bloom for months; us them to fill color gaps between the waxing an waning of perennials. Then the border will always have something to offer during each season. 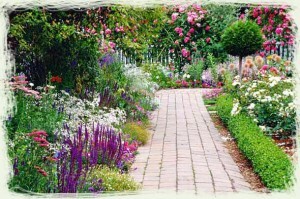 Cottage Gardens – most popular garden styles. The orginal cottage gardener used plants they were already given or they started plants from a seed. Shade Gardens – if you want an easy way to bring color to a shade area plant perennials. Many perennials suited to shaded garden area native wildflowers. Butterfly and Hummingbird Gardens – the larger the garden the more effective it is. These demand full sun and demand a mix of bright red, yellow and orange.